I can’t quite remember how old I was when I started to read. When I try to think back, I always see myself as knowing how to read. Never struggling, never being taught. Just knowing how to do it. I don’t even really remember being taught to read in school. I do slightly remember some phonics lessons. But no small group, scripted lessons that I’m required to provide to my students. I’ve always loved reading. Anyone who knows me would attest to the fact that I always have a book with me wherever I go. Anytime there is downtime, you will most likely find my eyes in a book. I can pretty much read through anything – noise, TV blaring, music playing, screaming babies. When I have that book it my hand, it’s an opportunity for me to escape, if only for just a while. It annoys my husband that I read in the car while he drives. It’s helps pass the time for me. I will pretty much read anything with words on it, whether it interests me or not. I’ve been known to read an entire novel in a day. Some books are really too good to put down. Hard to find a stopping point. My love of reading is a natural part of me. No one made me like it. No one forced me to do it. I just did it. And I still do. This is the story three generation of women. All three share their stories of love, loss, and personal growth. Aisha, Camille, and Geneva…daughter, mother, grandmother respectively. All have loved. All have lost. All have grown in more ways than they could have ever imagined. ”Geneva sighed and neatly folded a copy of the hometown newspaper, placing it on the kitchen table so that Mabel, the lady who comes twice a week to tidy things up a bit, could see the announcement. Baby girl getting married, Mabel would say. Seems like just yesterday she was runnin’ through this house wit’ me yellin’ after her to slow down. Always was in a rush. That little girl was someum’ else. Marrying a White boy, a rich White boy. You go ‘head, Miss I-esh-a. Miss Geneva can die a happy woman now – her grandbaby finally doing it right, she’d say…” p. 1-2. This book was alright. Me, being the perpetual editor that I probably should be doing by profession, found several grammar mistakes and typos in the book for one. Once I got past those technical annoyances, I was able to enjoy the book more. I think the plot was a bit weak and could have used more action or mystery. The book is predictable from the beginning to the end. I wasn’t left guessing or wondering. I wasn’t disappointed when I had to put the book down in-between reads. I finished the book with a “so, that’s it?” feeling. The story revolves around young, beautiful, self-absorbed, newly-engaged, Aisha Branch. Aisha has been used to having this easy her whole life. She’s engaged to a wealthy, old money wealthy guy named Will. Will just so happens to white. Aisha can’t get past the fact that he sees her as more of an “exotic beauty” than the intelligent woman that she is. Then in walks Miles – older, successful, and black. Aisha falls head over heels. She calls off her engagment to Will and in the so predictable end weds Miles. Aisha’s whirlwind love affair with Miles and shallow breakup with Will causes her mother Camille, and grandmother Geneva, to take a trip down memory lane and revisit their own stories of love and loss. 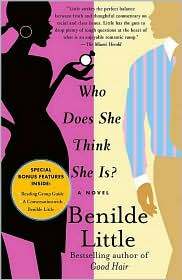 I’ve read other books by Benilde Little, Good Hair and The Itch, and they were just as disappointing from what I recall. It’s been awhile since I’ve read them though and I bought this book thinking, maybe the author would have grown. I expected much more than what I got. The book does include a bonus reading group guide that can be used in book clubs. Even though this was an ok read, I don’t expect to spend money on another Benilde Little book. I might, perhaps, pick one up from the library though, if I just so happen to see it. 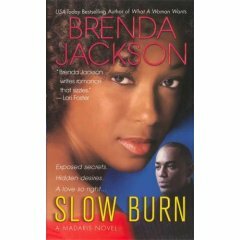 I’ve always enjoyed books by Brenda Jackson. This one did not disappoint, once I got past the slow beginning. Jackson built up to the climax that kept me guessing, wrongly might I add, to the very end of the book. I was pleasantly surprised. This novel is sure to please die-hard B. Jackson fans. This book is one of many following the exploits of the Madaris family. Skye Barclay accidentally finds out that she is adopted. Knowing this information helps her come to terms with the uncomfortable memories she has about her childhood. Against the wishes of her adoptive parents and her fiance, she breaks off her engagement and goes searching for her adoptive mother. She finds that her mother has died, but that she has a biological brother living. Her search for her brother takes her to Ennis, TX (wouldn’t you know this is 20 miles away from my birthplace.) There she meets the Madaris family and begins to form a relationship with her brother, Vincent, as well as an unexpected romance. When word gets out that Skye is getting close to the truth about her adoption, someone who wants to keep this information secret goes to great lengths to keep it that way. I do recommended, although it did take awhile to get to pick up and get to the action. However, I look forward to reading the other books about the Madaris family. Former Rain is the story of two women, Elizabeth Underwood and Nina Lewis. Both women have been through some diffcult struggles in life but how the transformation after the struggles are drastically different for each woman. One of them finds comfort in her faith and rediscovers herself and a newfound relationship with Jesus. The other becomes bitter and lets hate build up inside of her until she loose herself in it all. Both women are forced to look inside at themselves to see how they contributed to the negativity that had been drawn into their lives. In the end, friendship, love, and faith leads two families to happiness. I enjoyed this novel. Although I must admit that I sometimes steer clear of Christian fiction because I find it to be too “preachy”, that impression did not come across in this book. The lessons to be learned were clear. There are several books in this series and I plan to read them all. This was a pleasant read. I gave it 4 stars because the tempo was kind of slow at times.